This thali, of shallow rounded form, is of high-grade silver, beaten, chased and engraved with a central lotus flower medallion. It is bordered by double fluted bands of scalloped lotus petal niches and with a lipped rim. 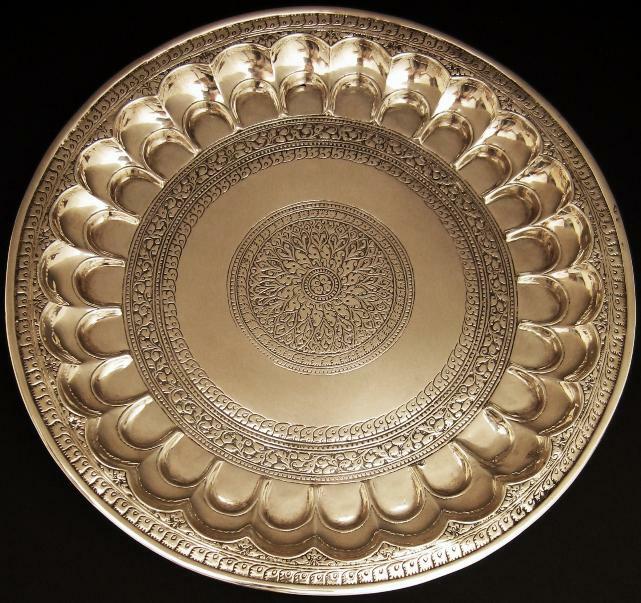 Double rows of fluting is characteristic of the silversmithing work undertaken in Pune and the adjacent region. Some old repairs are evident in this thali.Thalis such as this were used at elaborate Mughal feasts. Each guest was served with his own thali, made of either silver or gold. Originally, precious metals were preferred as they were believed to detect poison. Later, they were preferred simply for reasons of ostentation. A thali of almost identical form and design is in the collection of the Victoria & Albert Museum and illustrated in Terlinden, C., Mughal Silver Magnificence, Antalga, 1987, p. 104. A similar but larger thali is in the Los Angeles County Museum of Art, (inventory no. AC1999.248.1) and illustrated in Arts of Asia, July-August, 2002, p. 32.